Merry Connor’s hand shook as she sat in her gold Cavalier and inserted the key into the ignition. She glanced up and saw large snowflakes drop onto the windshield, but the bleak November weather had little to do with her discomfort. She didn’t know where that noise came from under the hood, but it definitely sounded like trouble. Whispering a short prayer, she took a deep breath and tried again. This time she heard nothing but the sound of her own heartbeat pounding in her ears. Rocket, the name her nine-year-old son labeled the car when she first brought it home, had been a reliable vehicle until now. However, from the looks of things, Rocket’s next trip would amount to a ride to the garage on the back of a tow truck. Unfortunately, towing didn’t come cheap. Neither did car repairs. For a divorced mother of two who could barely make ends meet, taking on more debt four weeks before Christmas meant financial disaster. She didn’t even have a Christmas tree yet, but that looked doubtful now. That is, once she’d solved her car problems. Today she’d have to walk to Marcey-Holmes elementary school to get the kids. At the end of the driveway, she turned right onto Nicollet Street and picked up the pace. According to her phone, she had exactly eight minutes to travel three and a half blocks to the Nicollet Island Inn and clock in for work. Luckily, the blocks were short and she always wore non-slip shoes. At Grove Street, she turned left, heading for East Island Avenue. She shoved her phone into her pocket and pushed open the Inn’s back door. Sounds of a busy commercial kitchen diverted her attention, giving her a temporary respite from her problems. She waved to the chef on duty as he called out an order to one of his line cooks. A server asked for a side of toast while pulling an array of completed dishes from under the heating lights and arranging them on a large tray. Kitchen workers stood at their stations, chopping vegetables for soup and preparing items for the dishes of the day. Merry hastened to find her security card and swiped one of the computers at the server station, clocking herself in exactly on time. She hung her empty tote and jacket on a hook then tied her long, black apron around her waist, mentally preparing herself for a busy day with friendly, interesting customers and great tips. Granted, she was barely making it financially, but life was good compared to two years ago when she’d lost everything—thanks to her lying, deceiving ex-husband. She’d come a long way since then and didn’t intend to look back. Even so, it would be a long time before she’d trust anyone with her heart again. The pungent aroma of fresh grilled beef and thick, crispy fries made Tony’s stomach growl. He reached for the ketchup, squirted a large puddle on his plate then dipped his burger into the thick red sauce and took a huge bite. They both nodded to signal they were satisfied and continued to munch on their meals. Tony glanced down and saw the contract amount. The house must be a total wreck to let it go that cheap. Neal’s low blow angered Tony, but even worse, it triggered a fresh wave of grief as the chilling memory of that snowy December night and the images of his lifeless wife and child flashed through his mind. Over time, he’d convinced himself he’d made progress in dealing with their deaths. Neal’s thoughtless words proved otherwise. Though the accident happened over three years ago, the pain of losing the greatest love of his life and his precious child still throbbed like a fresh wound, leaving a gaping hole in his soul. The mention of his sister’s mental state caused Tony to pause. He knew she’d been dealing with the condition for a long time, and during the holidays, it always seemed to get worse. He couldn’t deny that she’d helped him through the darkest time of his life, but it ticked him off to hear Neal play the guilt card to coerce him into action. Denise is a USA Today bestselling author of contemporary romance and romantic comedy. 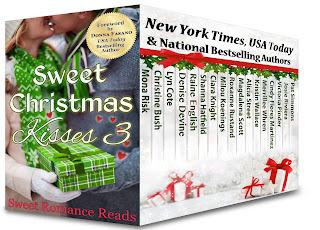 This first chapter "sneak peek" is part of the Sweet Christmas Kisses 3 boxed set now available for 99 cents (for a limited time) at all major retailers. Always a wonderful read, Denise. Thanks for sharing! By the way, I was lucky enough to find this writing service https://payforessay.net/coursework. I felt like was too difficult to write a good essay on time, so I decided to ask them for help. As a result, I got a brilliant essay written from scratch. What can I say, I was more than satisfied with their service in the end.